Asmara is the capital and largest city in Eritrea. The city has about 600,000 inhabitants and is located in the central part of the country at an elevation of over 2,000 metres at the north western edge of the Great Rift Valley. Asmara, compared to other capitals in Africa, is a beautiful city famous for its colonial building styles and in some aspects resembling a European city with styles like neo-Romanesque, Victorian and Art Deco found throughout the city. Therefore, this place deserves at least a few days to explore, including the national museum, before going to other parts of this not so often visited country. Asmara's main attraction is its colonial Italian architecture. The palm-lined main street "Independence Avenue" is colloquially referred to as "Kombishtato" (a creole of the neighbourhood's original name: Campo di Citta). It is full of cafés, bars, shops and old cinemas, and it makes for a nice mile long stroll between the north end of this avenue where the "half" stadium is (you'll know when you see half a bleacher) and the south end facing the Nyala Hotel, the city's tallest building. 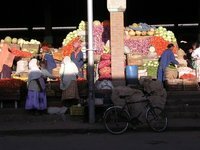 Asmara's colourful and bustling marketplace lies behind the cathedral on the road to its right (as seen when standing in front of the cathedral's main entrance on Independence Avenue). It's a great place to learn how to haggle and buy some souvenirs. National Museum of Eritrea - Is an ok museum that was opened in 1992. It is now located in the former Comboni Sisters School for Women. Italian Buildings - This includes mansions, villas, piazzas and coffee bars. Because of the altitude, Asmara has a very pleasantly warm climate, much unlike the coastal areas which can get very hot. In general, temperatures are still well over 20 °C and it gets rather chilly at night. May generally is the hottest month, with temperatures even above 30 °C during the day. July and August are relatively wet, but from September onwards it is usually dry and warm. Asmara International Airport (ASM) receives all international flights, among which those with the national airline Eritrean Airlines. International destinations include Djibouti, Dubai, Frankfurt, Jeddah, Milan and Rome. Lufthansa flies to Frankfurt and Jeddah as well. Other destinations with connections to Asmara are Nairobi, Cairo and Sana'a. Eritrean Airways flies between the capital Asmara and the city of Assab at least twice a week. There is a railway line between Asmara and Massawa, but services are infrequent and not timetabled. There are however extra trains that can be chartered by groups of tourists. It is a great journey! There are at least two buses a day between Asmara and Massawa and Keren and at least one daily service to smaller cities and towns. Buses leave when full, so there is not timetabled service. It is best to show up early at the bus station for long journeys, to assure a seat. Asmara has 10 downtown bus-lines on distinctive Red Mercedes Benz buses, with a sign in the front saying where they're headed (oftentimes in Latin script). The bus stops are easily identifiable (there are signs and an obvious shelter with a bench), but the buses stop running quite early in the evening (about 7:00pm). They run on 15-30 minute intervals during the day (every day), but there is no fixed or published schedule. The roads get pretty jammed at rush hours (in the morning, midday and around 4:00pm in the evening). The fare is 1 Nakfa, and the entrance is in the back where one buys the ticket. It is not necessary to have exact change, but one should try to pay in lower denominations. Line number 1 goes between the airport, 3 kilometres south of the city, and the zoo in Biet Ghiorghis, 2 kilometres east of the city on the eastern escarpment (the windy road to the Red Sea begins after Biet Ghirogis). Number 1 also passes through the main streets in downtown Asmara (Independence and Martyrs Avenues). All bus lines that begin with 2 (e.g. 21, 22, etc. ), run between the marketplace downtown and the surrounding villages, but there are only a few a day. Therefore, plan to leave early in order to be able to return the same day. Only the locals know the schedule (through word of mouth). If you're lucky one of them speaks English and will be very helpful. Some villages like Embaderho and Tselot are well worth visiting for their scenery and traditional lifestyle. There also white minibus-lines running on the main streets of the city, which run on fixed routes but without fixed stops or signs. They usually stop at the bus stops, but you still have to hail them when you see them, just like a cab. Before boarding, ask them where they're headed, unless the ticket-boy (called fottorino) doesn't beat you to it by announcing it loudly. Then, let them know when you want to get off ("Stop!" is a universally understood command). 2 Nakfa. Finally there are the yellow taxis, most of which also run on fixed routes on the main streets like the white minivans. They have a similar system to the minivans, and the fare is 5 Nakfa. You'll most likely be sharing the ride with 3 other people. Since some cabs do not use fixed routes, some will take you personally to where you want to go. These taxis are called contract taxis, and you will have to negotiate the price with the driver. The price depends on how far you're travelling, but most contract drivers charge, at a minimum, 70 Nakfa. These cabs usually wait outside the airport when a plane is coming in, the city's main hotels (Asmara Palace Hotel, Nyala, Ambassador etc. ), the road to the right of the main cathedral downtown and other obvious spots. They can also be hailed on any street, but many cabs are on a fixed route with passengers already in them. Renting a car is insanely expensive and fuel prices are higher than in Europe. Renting a cab to drive you around town is also quite expensive, but affordable. Be prepared to pay around 3,000 - 6,000 Nakfa for a weekend with a driver. It is perhaps better to take the bus or contact one of the national tour agencies (ask at the information desk at the airport upon arrival). Albergo Italia - for authentic Italian food. Alba Bistro - Opposite the Post Office. Castello - Behind the Nyala Hotel. Mask Restaurant - Hamburgers using quality organic beef or lamb. The Spaghetti and Pizza House, Harnet Avenue - a great choice of pizza and pasta dishes as well as its signature Chilli red snapper. Eritrea is not a big wine country, even though it used to have a wine-making tradition during the colonial period. On the other hand Eritrea, is a big beer-drinking country, and the Eritrean beer is definitely a good one if you like lager, pilsner or dark beer. All three varieties are made by the country's only brewery, which is in Asmara and is aptly called "Asmara Beer". Asmara Beer is great, quenches your thirsty throat and has a good taste. Between early 2008 and May 2009 it was not available, due to a lack of hard currency for buying imported malt. As of June 2009, nationwide distribution was back. Asmara brewers have proven they produce a good Pilsner beer. Most varieties have around 5% alcohol per volume and a nice hop flavour in the well known bottle. Enjoy! This is version 7. Last edited at 8:41 on May 26, 17 by Utrecht. 8 articles link to this page.